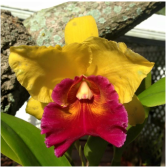 ﻿President of the Tropical Orchid Society, John Lopez is an avid orchid grower. Always willing to share his love of orchids with you and discuss care and maintenance of your plants! We thank you for your contribution to our gallery and look forward to many more!